starting from the beginning again, thanks netflix instant! guess who forgot to blog yesterday? 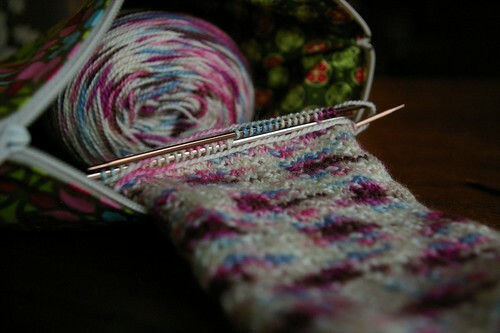 I'm knitting these socks for a Ravelry friend, Beth. The pattern is Charade (if you don't have a Ravelry account I don't think the link will work.) 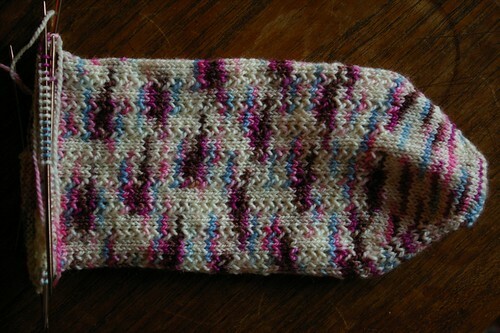 It's an easy knit, and I'm rearranging things and knitting toe-up instead of cuff-down. And I'm using these great Kollage square dpn's that I got in a swap. I LOVE THEM. They're short, metal, and the square shape feels great while I'm knitting. (I'm praying I don't lose any of them.) 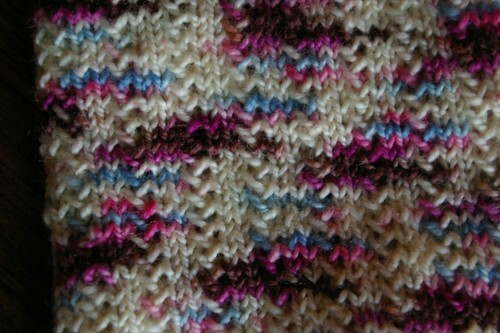 The yarn is Cherry Tree Hill Supersock Merino, which is so squishy and soft - definitely great to knit with. Anyway - on to the photos!